Photographed long the Mtembur River, West Pokot, Kenya. July 2014. 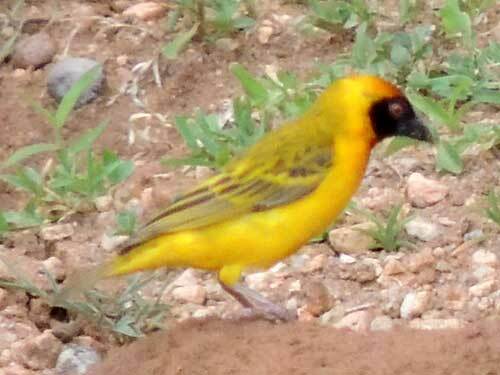 From Wikipedia: The southern masked weaver is 11-14.5 cm long with a short, strong, conical bill and pinkish brown legs. The adult male in breeding plumage has a black face, throat and beak, red eye, bright yellow head and underparts, and a plain yellowish-green back. The female has a pinkish-brown bill, brown or red-brown eye and is dull greenish-yellow, streaked darker on the upper back. The throat is yellowish, fading to off-white on the belly. The non-breeding male resembles the female but retains the red eye. The juvenile of this species is like the female. The call is a harsh swizzling, similar to other weavers. It also utters a sharp chuk alarm note. Copyright Michael J. Plagens, page created 19 May 2015.